Gitte: Every so often you come across a story that stands out for so many reasons and you thank your lucky stars this story ended up on your kindle, and we did just that didn’t we, Jenny?! Transcendence is just that story. It’s remarkable, outstanding, beyond anything you’d expect or predict and the emotion it elicits through mere words is beyond belief. I was left in a tearful mess and two days later I’m yet to find the ability to pick up another book. I still burst into spontaneous tears just thinking of Ehd and Beh; our hero and heroine. Their story is one of the most poignant, beautiful, heartrending, unpredictable and romantic I’ve read in a very long time. Bravo, Shay Savage, I’m in awe and clapping wildly with tears in my eyes at your talent! Welcome suspension of disbelief and what you know of and settle into one of the most romantic stories you can come across. The concept and execution of this story is dazzling, the writing superb. 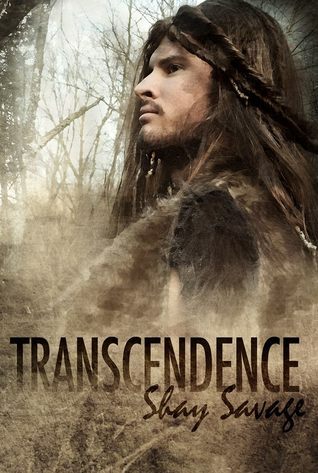 Transcendence screams originality and is extremely clever and imaginative. Being in the mind of a man who can’t communicate other than through behaviour and expressions you’d think that he’d be hard to connect to through thoughts alone, to fall in love with, to understand. However, Ehd was so sublimely written that it was as if the emotions were magnified by just that. It was incredible. It shouldn’t have worked but it did and it was beautiful. Ehd was beautiful. This story was beautiful. Yet, it was funny too, the humour injected in this love story was laugh out loud funny. I honestly can’t count how many times I laughed only to cry or melt in a short breath later. Truly astounding. The parallel with modern man is very cleverly written! Ehd was the original essence of man, un-complicated by present time. He had the organic aspect of love, protection and was a raw sexual being. This cave man was your original alpha male stripped down to the basic nature of his time. He was a rough canvas upon which modern day man was sculpted and I fell in love with him straight away. He was adoring, loving, patient, generous with his affections and passionate beneath those furs. He was a real man! Now, love comes in many guises and never so polar opposite and stretching the ‘expanse’ of time as the romance of our Ehd and Beh. I found some parts to be so emotionally distressing, I felt agitated and fearful and my heart though it belonged to Ehd bled and grew in size for Beh. The choices made, the belief that consequences to your existence are of no matter when it comes down to finding love in the least expected place and time. Finding your mate, your love, the other half of your soul. This is why I read romance. No question Jenny, the story of Ehd and Beh will remain an all-time favourite for me. I ‘Luffs’ it and you did too didn’t you?! Jenny: Gitte, I’m so thrilled we went with our gut and picked this one up because two days later and I’m still reeling from the feelings I took away from Ehd and Beh’s story which touched me deeply. First off, I have to admit that I’m somewhat stunned that I enjoyed this book as much as did because NEVER in my wildest imagination would I have expected to fall completely in love with a story, be swept away by the emotion and experience such a strong connection to the characters, with no dialogue! I’m still coming to grips with how brilliantly Shay Savage executed this story. Standing ovation absolutely required here! I’m a dialogue junkie. It’s how I connect to a story and its characters and without it, I feel as if a story is being told to me rather than living in the moment, however Shay Savage turned my thinking on its head in Transcendence because I felt every single thread of emotion through Ehd. I felt every hurt, every joy and every vexing and perplexing moment, every ounce of tenderness, anguish and confusion and I felt it all deep in my heart. I didn’t just read this story, I lived it and like you Gitte, I found myself crying one minute and giggling the next as we maneuvered our way through Ehd’s thoughts. This was love in its rawest form. Ehd and Beh’s love was all encompassing and epitomized the soul mate love story without question. So much was conveyed through a touch, a smile, a look, a gesture. No words were required to express the love between these two, because their love was soul deep and transcended verbal communication. Your heart can’t help but go out to Ehd. An alpha male in the truest form, who possesses a heart that was built to love, a tenderness that belied his surroundings, a constitution that was built to provide, hunt and protect, a deep seated need to procreate. All this, together with a somewhat childlike quality, a pure innocence in the simplicity of his thought processes enabled me to complete connect to Ehd. To feel his need for companionship after the loneliness he was forced to endure was gut wrenching. On the other side of the spectrum was Beh. This young woman showed amazing fortitude for not only adapting to her surroundings, but for embracing them. As difficult as it all was for Ehd, we can only imagine the struggles Beh encountered in her new and confusing life and despite not seeing this story though Beh’s eyes, I was still able to connect with her and share her fears and anxieties. This book brought me to my knees. I sobbed after I finished it, and have also struggled to pick up another book since. Although the setting may be prehistoric, the essence of the story is very relevant to now and as such, you relate to Beh and Ehd’s story completely. This story kept me guessing from start to finish. It’s one of the very few times I’ve been engrossed in a book and had no idea where or how the story would develop and conclude. I would think I had it figured out, only to be thrown for a loop and that was another aspect about this story that won me over. It was unpredictable, gripping, funny, sad, beautiful and unlike anything I’ve experienced. SUPERB!!! I want to ‘khizz’ this author’s feet G, because I completely and utterly ‘luffs’ this book too! J&G: This book exceeded all expectations and one thing we’re particularly pleased about is the fact we knew nothing about this story. We had not read anything, other than the synopsis before starting Transcendence and went into it blind. We knew nothing about how their relationship came to be, how it developed nor the why’s and wherefores of the story, and we have to say…for this, we are extremely grateful. A lot of us bemoan the fact that we crave something different, something unique to sink our teeth into. Well for us, Transcendence was everything we could have asked for an more and it delivered on every count . To experience this story with no pre-conceived ideas nor to have any parts of the story revealed to us added to our enjoyment. Each page was a surprise and a joy to read, even if at times it did break our hearts and left us sobbing. This standalone story is one we would recommend in a heartbeat and we ask that you go into it with an open mind, an accepting heart, leave all pre-conceived thoughts at the door and if you do, we absolutely guarantee you will be rewarded with something very special and a reading experience that is unique, refreshing and unlike anything you’ve read before. An extraordinary story, told in a beautifully extraordinary way. Be sure to have plenty of tissues handy! Were they tears of happiness or sorrow? You will have to find that out for yourselves, but trust us…the journey this book takes you on is worth every single tear you will shed!